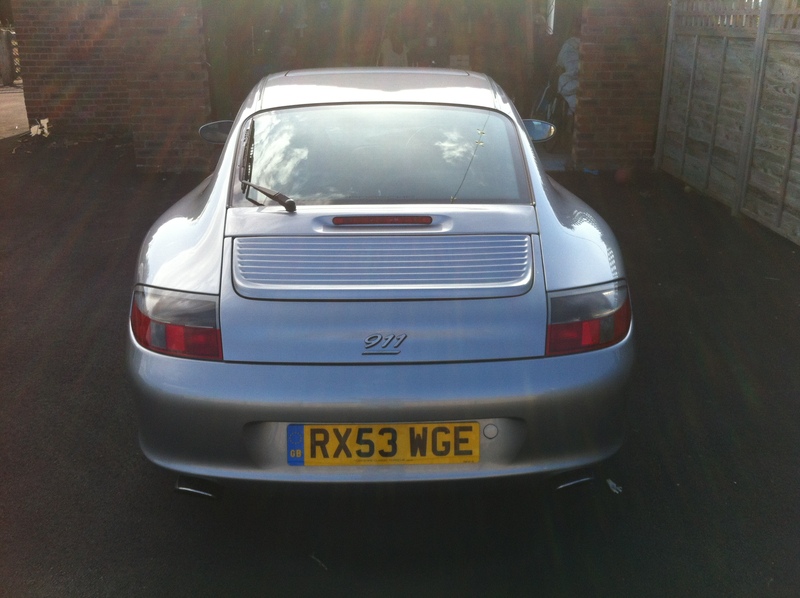 Just ordered a simple ‘911’ badge which is 35mm high and originally from a 993 (993.559.237.01.70C). This is to replace the Carrera badge on a 996.2. Looking at the engine lid its quite curved in the vertical plane, and there doesnt seem an obvious place to stick it. I’ve seen lots of cars with the 911 badge so know its doable and just wondered where to place it. Not sure if the 996.1 engine lid is different? Any photos and advice greatly appreciated. Hopefully I’ve got the right size!! The 40th anniversary edition of the 996 was a Gen2 car and had the '911' badge as standard fitment. Google Images will give you plenty of angles to view it from. 996Lee - thats an interesting and useful thread - reminds me I need to check out my fan resistors! Had another look and think I’ll put it roughly where the Carrera badge is now. Immediately below the spoiler looks semi flat, then there is a hump, then semi flat again as it nears the edge of the panel. So, the plan was to remove the Carrera badge, clean up the paint with some Menzerna polish and stick on the new ‘911’ badge. What could possibly go wrong? Dental floss to get the old badge off , some meths to remove the sticky residue and that’s when I spotted the problem!! The original trim tape appears to have affected the lacquer and has left a shadow on the paintwork. Quick rub with some 2200 grade polish and its better but still shows. 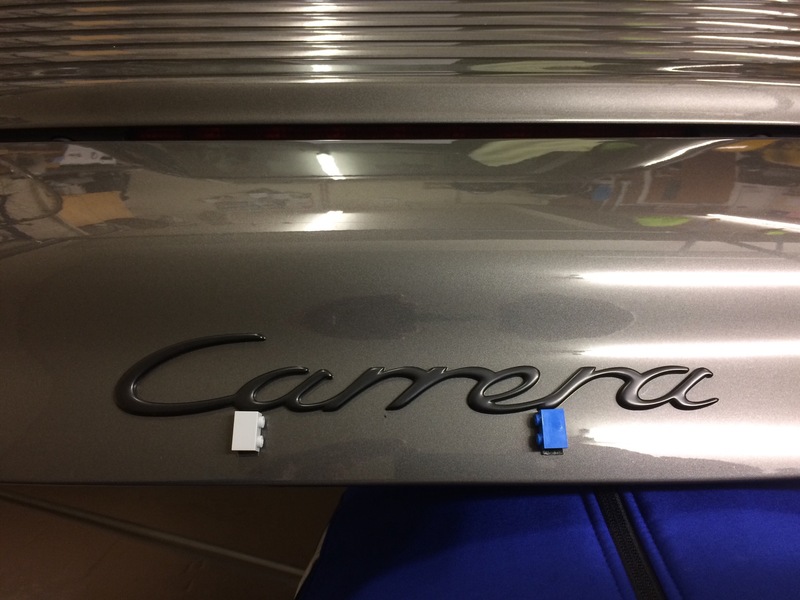 So, dilemma now is to buy a new Carrera badge (£44) or re-tape the old one. As I have trim tape in stock I decided to re-tape it and developed the following process to cut out the intricate pieces of doublesided trim tape. The main problem is the tape is much smaller than the outline of the badge. On mine the back of the badge has a lip near the edge and the tape must be inside of this lip. Firstly I did this in 4 pieces rather than one long run. In the Carrera script there are places to join easily. 1)	Place your badge back down onto a piece of greaseproof paper and trace neatly around it with the pencil. Place the badge carefully to one side. 2)	Use the sharpie to draw around the inside edge of the pencil outline. This should give an approximate 1.5 MM reduction all the way around and give you your cut lines. 3)	Flip the greaseproof paper over and stick on a piece of trim tape so it covers your outline. Just to be clear the tape needs to be stuck on the opposite side of the paper to the traced outline. 4)	Flip the paper over again and place tape side down on the chopping board. With the knife carefully cut around the edge of the sharpie line, through the greaseproof paper and trim tape. Use one hand to hold down the paper / tape and pull knife towards you, away from your other hand. Keep moving the paper around so the cut is always away from the hand holding it (its safer and you can control the cutting better) Once complete, remove the ‘spoil’ from the edges, cutting any bits you missed with the initial cut. Try not to pull any un-cut bits as it could tear. Gentle and slow. 5)	Check the tape fits the back of the badge and trim any bits as appropriate. 6)	Peel greaseproof paper off and stick tape to rear of badge. 7)	Once badge fully taped, reattach to the car. PS – For Sale brand new 35mm black 911 script!! Thanks for the excellent 'how to' write-up. I've merged it with your original thread and changed the thread title. Oops - forgot about my earlier post so thanks for linking it together. Being a bit OCD I like things neat and tidy! Another top tip - after you've spent 2 hours devising a process and cutting out trim tape make sure you stick it on the car level! 1mm out Doh! I guess cutting out the tape will be quicker second time around - already thinking of a foolproof method to stick it back on level second time!. All the best laid plans eh. The badges often leave a shadow when they’ve been on for years. As for re-taping the badge, I just buy 4mm wide trim tape and curve it to the shape of the badge. Had to wait for new tape supplies. Second attempt at sticking it back went much better with some lateral thinking!